A noble and extremely kind gesture has been served by the proceeds realised from the the sale of a very rare Edwardian diamond tiara which was put under the hammer on 17th April 2014. According to auction house Fellow Auctioneers, this rare piece has been donated to the UK based Cancer Research Leukemia division by a London based vendor. As per media sources, the design of this unique tiara has been hugely inspired from the quintessential garland style. Reportedly this grand piece contains an estimated 10.00 carats of old cut diamonds. 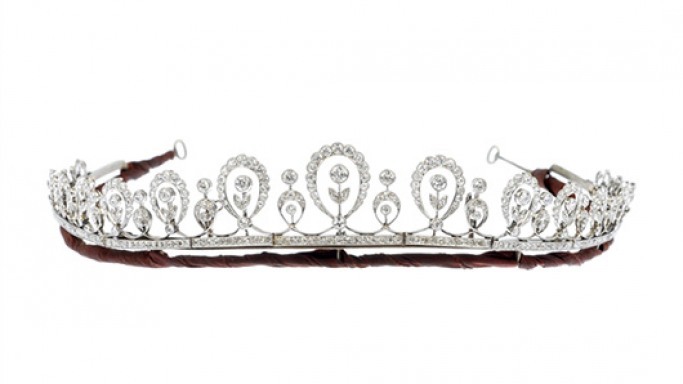 However it was reported that this stunning tiara would initially fetch around $8,000 to $11,000 in an auction. However the final result exceeded all expectations and the tiara managed to achieve the final hammer price in excess of $20,000. A major point of attraction during the high end Edwardian period was the wearing of beautiful tiaras, an act that was governed by strict Edwardian etiquette. It seems that unfortunately many items dating from that special era that had a more limited use have either been dismantled or broken up. Therefore this unique tiara is a coveted rare survivor. Strangely this stunning piece was last worn at a grand family occasion. It is believed that the tiara has not seen the light of day for several ages. According to Stephen Whittaker, the managing director of Fellow Auctioneers the rare tiara is very a beautiful example of that special era and therefore it had every possibility of faring well at the auction. He even claimed that the most wonderful thing about this auction was that its high hammer price has gone to such a great cause.